Offering you a complete choice of products which include labour quarters and readymade labour quarters. As well as godowns, Labour quarters etc as per customers' requirements. We manufacture our product on the labour company and install it on a site. Moreover, the expenses of completion of a wall like transport labour expenses etc. are included except cement, sand, greet and water which are normally used for installing the wall. Whether you are building a cabin for a small guard house, labour quarter or a large construction site office, smart cabin has all the right materials for you. We design and build security cabins that are highly durable and secured. Our comprehensive range of security cabins ensures that security guards have a safe, secure, weatherproof environment to perform their duties. 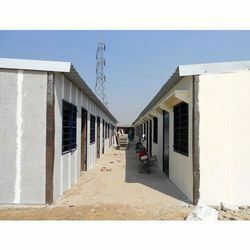 Backed by our industrial expertise, we are able to come up with best quality Insulated Readymade Labour Quarters. To suit the various requirements of customers, we design these office buildings in compliance with their specified details. We have hired expert professionals who make personal interaction with customers, understand their demands and by using supreme grade material manufacture these office buildings, accordingly.